Centennial, Colo., (Nov. 19, 2015) – As the most experienced launch company in the nation, United Launch Alliance (ULA) announced today it is taking CubeSat rideshares to the next level by launching a new, innovative program offering universities the chance to compete for free CubeSat rides on future launches. "This is exactly the kind of collaborative innovation that we celebrate in Colorado," said Lt. Gov. Joseph Garcia. “Here, we have a Colorado company giving Colorado students at a Colorado university an unbelievable opportunity to send a satellite into space. What a great day for our state." In addition, ULA is offering the nation’s universities the chance to help name the new CubeSat program. Universities, educators and students can submit names for consideration to ULACubeSats@ulalaunch.com using a campus-issued email address. Submissions are due by Dec.18, 2015. The winning name will be announced early next year, and the institution will receive a free CubeSat launch slot on a future mission. As America’s ride to space, ULA has launched 102 missions, including 55 CubeSats, with 100 percent mission success. 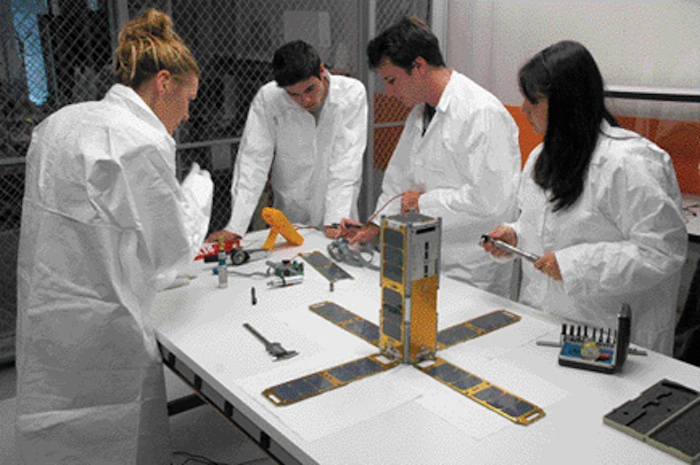 CubeSats are miniaturized satellites originally designed for use in conjunction with university educational projects. ULA is taking CubeSat rideshare to the next level by launching a new, first-of-its-kind program in the commercial industry to allow universities and students to compete for the opportunity to be awarded a free CubeSat launch slot. ULA will offer universities the chance to compete for at least six CubeSat launch slots on two Atlas V missions, with a goal to eventually add university CubeSat slots to nearly every Atlas and Vulcan launch. Since it began operations, ULA has been committed to science, technology, engineering and math (STEM) education initiatives. Innovative programs such as this help motivate, educate and develop our next generation of rocket scientists and space entrepreneurs, while making space more affordable and accessible for 100s of rides in the coming years. The CubeSat launch program will be available to all U.S. accredited colleges and universities. These colleges are encouraged to team with K-12 schools to further expand these opportunities throughout the science, technology, engineering and math (STEM) community. Interested in receiving the RFP? Email us at ULACubeSats@ulalaunch.com. Are you a K-12 school interested in launch? Learn about submitting a Student Rocket Launch payload. A) The program will be available to all U.S. accredited colleges and universities. These colleges are encouraged to team with K-12 schools to further expand these opportunities throughout the STEM community. Q) What is the size of the CubeSat launch slot? A) The volume is the standard 1U CubeSat at 10 cm x 10 cm x 10 cm (4” x 4” x 4”) and approximately 1.3 kg (3 lb). Q) Does the college or university have to be accredited? A) Yes, the college or university must be accredited. The college or university also must provide undergraduate degrees; graduate and/or doctorate-only universities are not eligible to participate. Q) How many free slots are available? A) Targeted in earlier 2017, a total of six 1U CubeSat launch slots will be offered on two selected Atlas V missions. Q) What if a group of students want to submit a proposal? Do they have to be from a university or have the backing or support of the university? A) Yes, students submitting a proposal must be associated with and have support of their college or university. In addition, students are encouraged to gain support from industry and USG programs that provide financial assistance to CubeSat developers. Q) Can middle and high schools, as well as elementary schools, submit proposals? A) No, not at this time. Competing colleges and universities are strongly encouraged to partner with local elementary, junior and senior high schools and include students on their teams. Proposals with local K-12 student participation will be assessed higher under the selection criteria. K-12 teams may be interested in submitting a Student Rocket Launch payload. Q) Where do the CubeSats ride? A) The CubeSats will ride in the Aft Bulkhead Carrier (ABC), which is located at the aft-end of the Atlas V Centaur second-stage. Q) Can a university be awarded multiple CubeSat launch slots? A) No, for each RFP process, a university only can receive one award. Q) What are the selection criteria? A) The proposals will be evaluated on quality, feasibility, innovativeness and outreach opportunities. Q) How is ULA's CubeSat initiative different from other CubeSat launch programs? A) There are a number of U.S. government-sponsored CubeSat programs that provide launch opportunities, including NASA's CubeSat Launch Initiative and the US Air Force's University Nanosat Program. ULA's CubeSat program complements these efforts. Additionally, ULA's initiative is the first major U.S. launch service provider to move forward with commercially manifesting and launching CubeSats directly onto ULA vehicles.